'Tis the season of the wide-brimmed hat. Whether with a boho dress, sharp blazer, swimsuit, or casual jeans-and-a-tee look, a good hat will take you far. 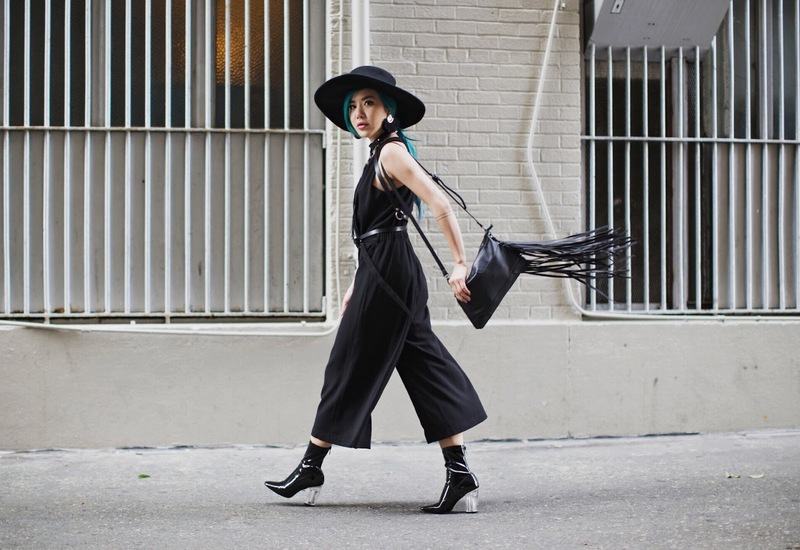 I styled this particular hat with a simple (but very cool) wrap jumpsuit. Accessorizing its sleek lines with leather accoutrements toughens up a basic staple, as I am prone to do. I prefer my hats in the wide-brimmed variety--the more drama (in my wardrobe), the better. A couple necessary features in my everyday hat are said wide brim, wool or felt fabric, and stiff overall construction. PRO TIP: If you find the perfect hat but it's too big for you, fear not--for a quick fix, simply tie a bandana around your head and put the hat on over it, like so. Adelyn Rae jumpsuit (similar here). that tip about using a bandana is golden! Going to try it right now! Hi, Our engaging women are amazingly responsive and know how to handle men, so let them know everything about your wishes and they are all the more then fiery to fulfill those. Say Obat Pegal Linu Di Pinggang thanks .. Your are looking so pretty in black dress, i like your dresses and your fashion. Thanks for share this great fashion with us.